ON THIS DAY 14 YEARS AGO: Brian Strain marks the end of an illustrious Irish League career as he leads Bangor to a 2-1 win over Glenavon at Mourneview Park. 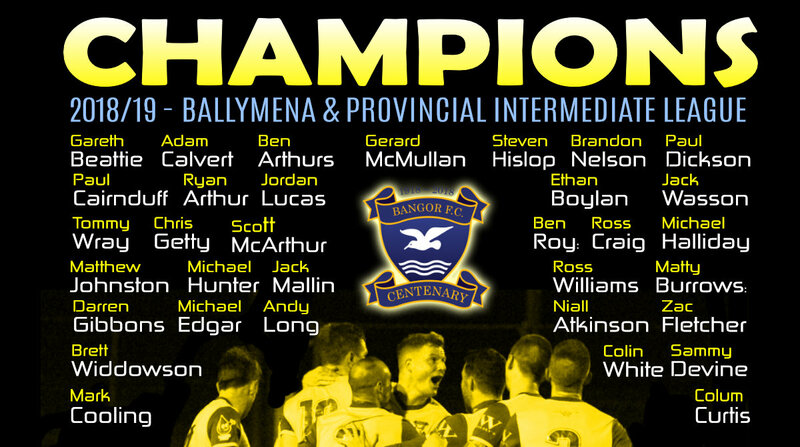 Bangor secured the Ballymena and Provincial Intermediate League title on Thursday evening with a 3-1 win over St. James Swifts at Suffolk Road. Gerard McMullan broke through to score the opener for Bangor after 17 minutes, but Marty Murray looped the ball over Gibbons to level it for the Swifts after half an hour. Both sides squandered several excellent chances before the break, with Scott McArthur and Ben Arthurs shooting wide from great positions and the Swifts firing one off Bangor’s crossbar. The breakthrough for Bangor came in the 64th minute when Ben Arthurs caused havoc in the Swifts’ area and lashed the ball home from 10 yards. Defender Tommy Wray extended Bangor’s lead in the 75th minute when he powered home a Mark Cooling corner kick. Mark Clarke was dismissed for the Swifts as Bangor celebrated. 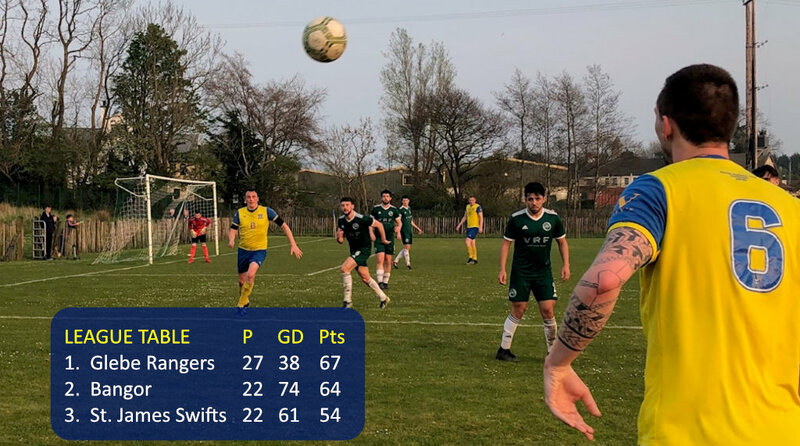 The Bangor defence withstood some late pressure from St.James, but in the end held firm to secure the win and the club’s first ever league title while playing as Bangor F.C. The Seasiders now must now wait for an official response to see if a promotion play-off is required to re-enter the Premier Intermediate League next season. Bangor took a step closer to clinching the League title this evening with a resounding 6-1 victory over Donegal Celtic at Suffolk Road. Michael Halliday produced a moment of quality after 21 minutes when he picked out Ethan Boylan who headed home from 6 yards. However Bangor's celebrations were short-lived as DC were back level within a minute when a poorly marked corner kick was headed past Gibbons. Bangor got back in front in the 35th minute when Ethan Boylan was on target for his second of the night from the penalty spot after he had been hauled down in the area. Mark Cooling stroked in a glorious third for Bangor from the edge of the area in the 54th minute and four minutes later Scott McArthur rounded the keeper to slot in Bangor's 100th League goal of the season. Cooling raced through to slide the ball under the advancing Celtic keeper for number five in the 64th minute and substitute Ben Arthurs completed the scoring with a well struck finish from the edge of the area in the 71st minute. A draw on Thursday night OR one more win from any of our three other remaining league fixtures will be enough to secure the title for Bangor. D.Gibbons, G.Beattie, P.Dickson, M.Edgar, M.Johnston, S.Hislop(B.Arthurs), M.Cooling, S.McArthur, E.Boylan(J.Mallin), M.Halliday(M.Burrows), J.Lucas. Bangor moved to the top of the league table with a 6-1 victory over Cookstown Youth at a warm and sunny Bangor Fuels Arena this afternoon. Bangor took the lead midway through the first half when Ben Arthurs' goalbound header was poked over the line by Matty Burrows. Bangor were awarded a penalty for a clumsy challenge on Ben Arthurs in first half stoppage time - Mark Cooling made no mistake from the penalty spot. Cookstown Youth were given a lifeline in the 57th minute when Tavares robbed the ball from Gareth Beattie and raced through to fire past Gibbons. The Seasiders survived a nervous 10 minutes, but two quick dismissals saw the Cookstown team reduced to 9 men with 15 minutes to play. Substitute Michael Halliday took full advantage by stretching to poke in a cross from Ben Arthurs for number three and he then danced his way through the defence to prod home number four with two minutes left on the clock. Ben Arthurs chipped in with a goal in the 89th minute and Halliday completed his hat-trick with a penalty in injury time after he had been fouled inside the area. Bangor closed the gap at the top of the table to three points this evening with a 3-0 win over Dunloy at McCamphill Park. The Seasiders were on top for much of the first half but had to wait until the 48th minute to find a breakthrough. Scott McArthur was on hand to score when a Michael Halliday shot was parried out by the Dunloy keeper. An unmarked Ben Arthurs made it 2-0 in the 62nd minute when a Jordan Lucas cross was flicked on to the far post. Four minutes later Michael Halliday glanced in a long throw-in from Ryan Arthur to make it 3-0. D.Gibbons, G.Beattie, T.Wray, R.Arthur, M.Cooling, J.Wasson, B.Roy, S.McArthur(J.Lucas), G.McMullan, B.Arthurs, M.Halliday(M.Burrows). Brantwood 2-0 Glebe Rangers, Newtowne 3-3 Coagh United, St. James Swifts 5-0 Desertmartin. Bangor continued their excellent run of league form this evening with a thrilling 4-2 victory over Ballynure OB at Mossley Park. The Seasiders fell behind midway through the first half when Kyle Abernethy prodded in a low near post cross from the left. Bangor were level eleven minutes later when Scott McArthur fired in a Paul Dickson cross from the edge of the area. Bangor brought on Ben Arthurs and Gerard McMullan at half-time, but fell behind when a defensive lapse allowed Bobbie Crowe to loop the ball over Gibbons' head and into the net. Hugh Sinclair brought on substitute Ethan Boylan and he had an almost instant impact when he volleyed home a Ben Roy corner to make it 2-2 after 67 minutes. The goal of the night came in the 70th minute when Ben Roy unleashed a thunderbolt of a shot from 30 yards which crashed into the net off the crossbar. Ben Arthurs sealed the game in injury time when he was on hand to nod in a Gerard McMullan cross across the goalmouth. D.Gibbons, G.Beattie, P.Dickson(E.Boylan), T.Wray, R.Arthur (G.McMullan), M.Johnston, S.Hislop, S.McArthur, B.Roy, M.Burrows (B.Arthurs), M.Halliday. Bangor had to twice come from behind to secure a 5-3 victory over Newtowne at a very blustery Scroggy Road this afternoon. A Mark Cooling 40 yard wind assisted free kick sailed into the net after 5 minutes, but two well taken goals on 14' and 19' saw Newtowne take the lead. Ryan Arthur rose highest to head Bangor level on the hour, but Newtowne were back in front within a few minutes when a 25 yard strike caught the wind and sailed into the top corner of Darren Gibbons' net giving the Bangor keeper no chance. Ben Arthurs bustled his way through the Newtowne defence to blast in a leveller in the 76th minute, and a few minutes later, Bangor were in front when substitute Michael Halliday headed in number four from close range. Mark Cooling ended an afternoon of high drama with a magnificent dipping 20 yard free-kick. D.Gibbons, G.Beattie, T.Wray, M.Johnston, R.Arthur(M.Burrows), M.Cooling, J.Wasson, S.McArthur, J.Mallin (J.Lucas), B.Arthurs, E.Boylan(M.Halliday). 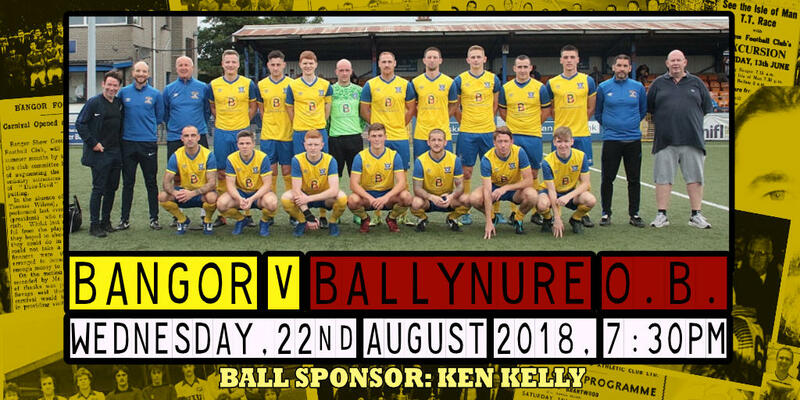 A barrage of second half goals saw Bangor overcome a difficult Ballymoney side at the Riada Stadium this evening. Bangor looked to be out of sorts for much of the first half, but still managed to take the lead in the 17th minute when Ben Arthurs headed in a a pinpoint cross from Matthew Johnston on the right. Ballymoney looked dangerous throughout the first half and they were gifted a goal from slack defending on a corner kick in the 22nd minute. A revitalised Bangor side were back in front just moments into the second half . Scott McArthur powered home a bullet header from a well delivered ball from the left. McArthur was the provider five minutes later when he raced to the byeline and pulled the ball back across the goalmouth for Ben Arthurs to tap in his second of the game. 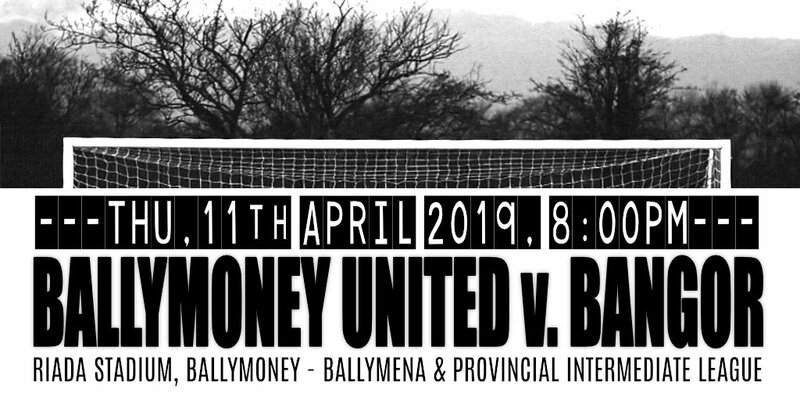 Ballymoney were reduced to 10 men just after the hour and it wasn't long after that Gerard McMullan kept his cool to slide in Bangor's 4th of the night. Lively substitute Jordan Lucas started and finished off a fine passing move in the 77th minute for Bangor's fifth. D.Gibbons, G.Beattie, S.Hislop, P.Dickson, M.Johnston, M.Cooling, J.Wasson, S.McArthur (M.Halliday), G.McMullan (J.Lucas), B.Arthurs, B.Roy(J.Mallin). Bangor ran out 4-0 winners over Chimney Corner at Allen Park this evening. Ben Arthurs opened the scoring after just three minutes when he rose highest to glance in a Ben Roy cross from the left. Scott McArthur pounced on a rebound off the keeper to fire home Bangor's second in the 27th minute. Ben Arthurs did well to control a long ball over the top and loft the ball over the keeper for Bangor's third in the 31st minute. It looked very much like Gerard McMullan had given Bangor their fourth goal on the hour when his shot canoned down off the crossbar and appeared to have crossed the line. No goal was awarded. Chimney Corner were reduced to ten men in the 71st minute when Scott McArthur was tripped when clean through on goal - Mark Cooling curled in the resultant free-kick to complete the scoring. Bangor crashed out of the Crawford Cup this afternoon, losing on penalties to Cookstown Youth following a 3-3 draw at the Bangor Fuels Arena. Bangor fell behind in the opening minute when Darren Gibbons misjudged a cross and presented Cookstown with an easy chance to score from close range. The Seasiders got back in the game in the 13th minute when Michael Halliday stroked home a penalty kick. Gerard McMullan put Bangor in front when he headed home a Matty Burrows cross in the 39th minute, but Cookstown Youth were back level soon after the restart when Stewart bundled in a deep cross. A neat finish from Matty Burrows gave Bangor a 3-2 lead in the 70th minute, but a disastrous back pass from Scott McArthur in the 80th minute gave Steven Arrell an easy chance to make the score 3-3. 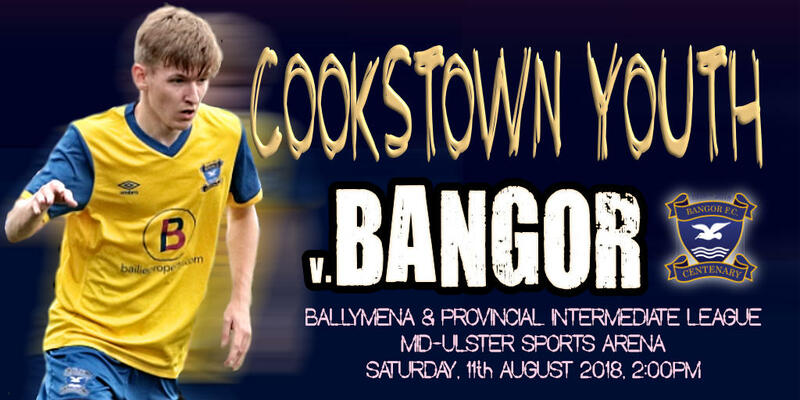 Despite seeing Cookstown Youth reduced to 9 men through injury in the closing stages of the second half, Bangor failed to drive home their numerical advantage and the game headed for extra time. Cookstown defended with resilience in extra time and with no further scoring the game ended with a penalty shootout. Michael Halliday, Ben Roy and Gareth Beattie found the net with their spot kicks, while Gerard McMullan and Tommy Wray saw their shots saved and Matty Burrows lofted his kick over the bar. We would like to wish Cookstown Youth every success in the rest of their Crawford Cup campaign this year and we wish their injured players a very speedy recovery. 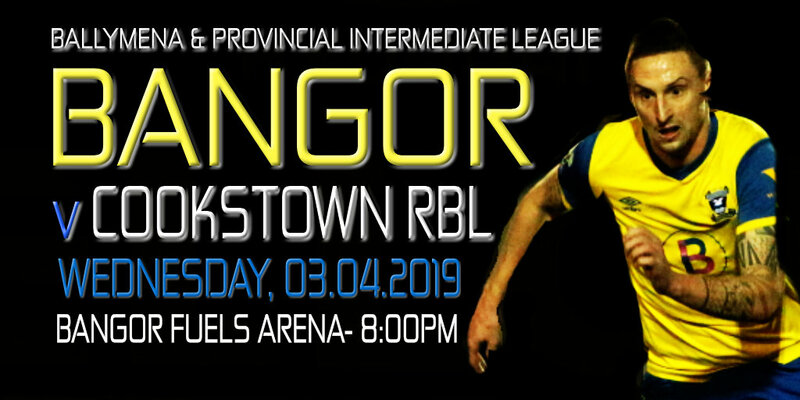 Bangor ran out 8-2 winners over Cookstown RBL at the Bangor Fuels Arena this evening. Gerard McMullan, Ben Roy (2), Gareth Beattie, Michael Halliday, Ben Arthurs and Matty Burrows(2). D.Gibbons, G.Beattie, T.Wray, P.Dickson, M.Johnston, S.McArthur, B.Roy, M.Cooling (J.Lucas), G.McMullan, B.Arthurs (M.Burrows), E.Boylan (M.Halliday). Thankfully the sinkhole has had no impact on the playing surface and there will be no disruption to matches at the Bangor Fuels Arena. The sinkhole has been safely cordoned off with bollards and players will be warned to take care with their run ups on long throw-ins. 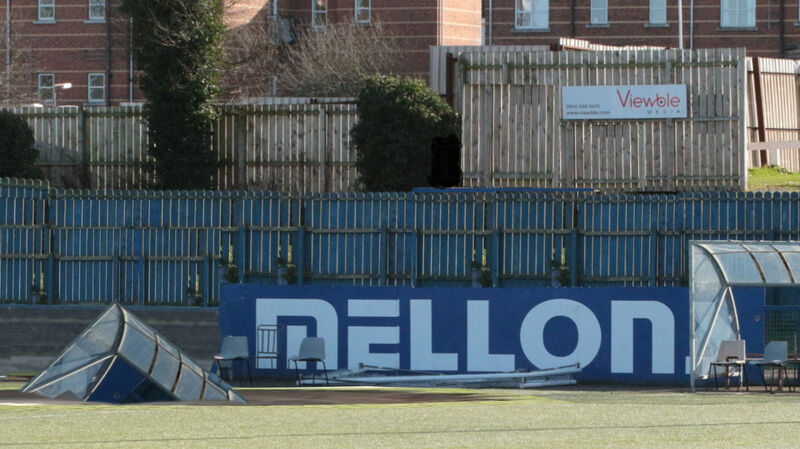 The home dugout will be replaced by a yellow and blue gazebo with matching deckchairs for the remainder of the season while a forklift truck will provide a temporary vantage point for the club cameraman. Bangor made it through to the Final of the McReynolds Cup this afternoon with a 3-0 victory over Glebe Rangers at the Bangor Fuels Arena. Gerard McMullan curled in the opener from 20 yards on the stroke of half-time and the second half had barely started when Ethan Boylan was set up neatly by Ben Arthurs and his half-volley soared into the top corner of the net. Darren Gibbons had to produce several fine second half stops to maintain a clean sheet, before substitute Ben Roy drilled in a low 20 yard strike in the 88th minute for Bangor's third. D.Gibbons, G.Beattie, T.Wray, R.Arthur, M.Johnston, S.McArthur (J.Lucas), S.Hislop (B.Roy), M.Cooling, G.McMullan, B.Arthurs, E.Boylan (M.Burrows). 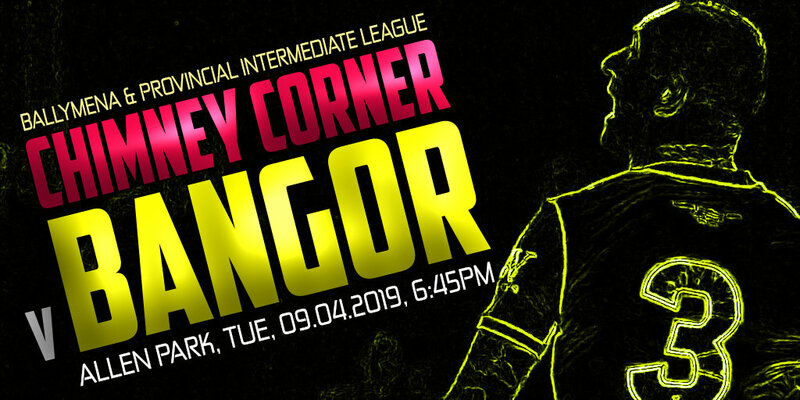 06.04.2019 - Bangor v. Cookstown Youth, Crawford Cup (Q/F), Bangor Fuels Arena, 2:00pm. 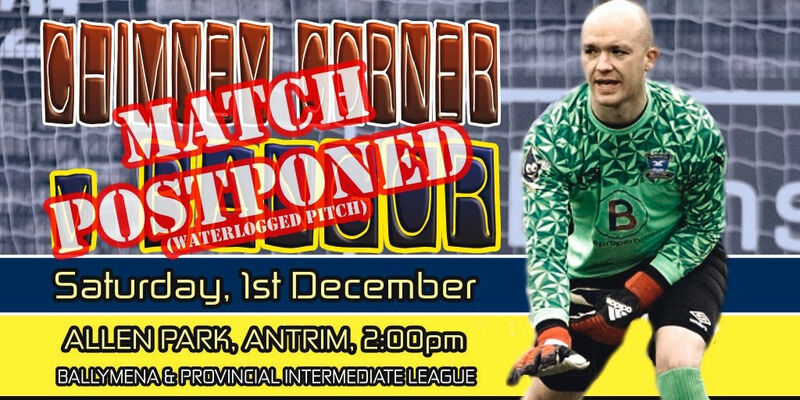 Bangor's match against Donegal Celtic which had been scheduled for Wednesday evening has now been postponed. Donegal Celtic have advised us that there is a health and safety issue with the away stand. A revised date for this fixture has yet to be arranged. 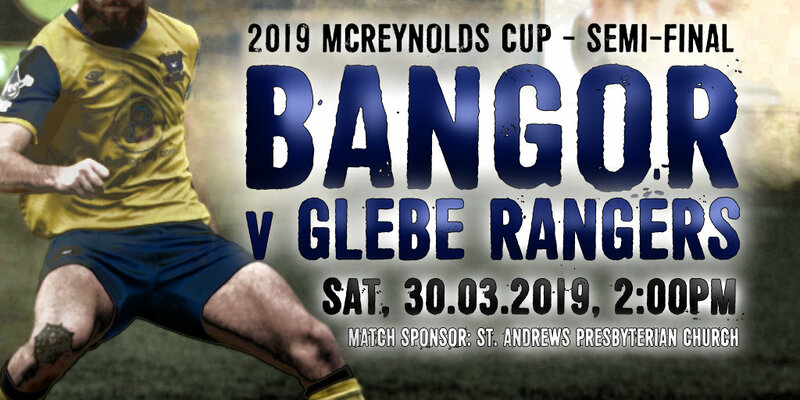 Bangor will be back in action on Saturday when Glebe Rangers visit the Bangor Fuels Arena for the McReynolds Cup semi-final. Match Kick Off 2:00pm. 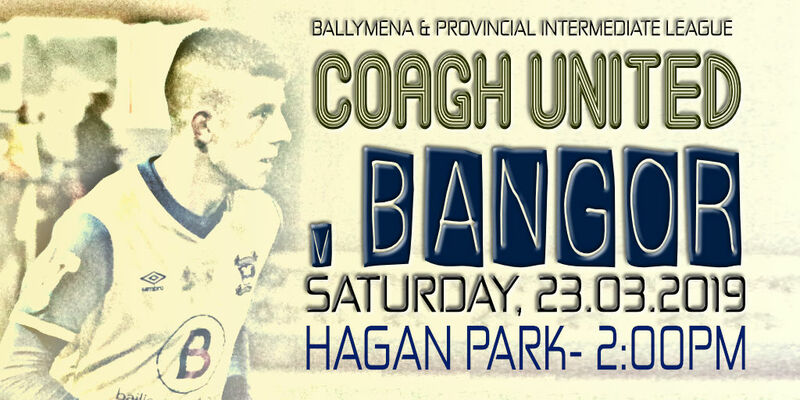 Bangor had to dig deep to get the result against a very well organised Coagh United side at Hagan Park this afternoon. Substitute Scott McArthur caused confusion in Coagh's six yard box in the 69th minute when a Gerard McMullan header looked to have been saved on the line, but the ball somehow ended up in the back of the net. Michael Halliday, Ethan Boylan and Gerard McMullan all went close for Bangor who were left hanging on to their narrow lead in the closing stages of the match. Darren Gibbons was on hand to tip a looping shot over the crossbar in the final moments of a what was a very tight game. D.Gibbons, G.Beattie, P.Dickson (S.Hislop), T.Wray, M.Johnston, M.Cooling, B.Roy(S.McArthur), J.Wasson, B.Arthurs, M.Halliday(E.Boylan), G.McMullan. 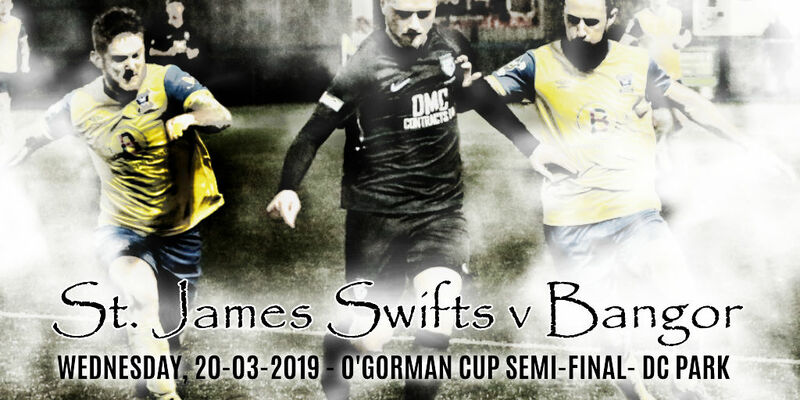 Bangor missed out on a place in the O'Gorman Cup Final this evening, losing 4-3 on penalties to St. James Swifts at Suffolk Road. Following a scrappy first half, Brendan Glackin got on the end of a corner kick on the left to give the Swifts a 58th minute lead. Bangor fought back and substitute Ben Arthurs scrambled in the leveller after 72 minutes. Gerard McMullan came close to a late winner in the 86th minute, but his side-footed effort clipped the crossbar on the way over. With the game tied at 1-1 and no goals in extra-time, the sides faces a penalty shootout. On target for Bangor were Ben Roy, Matty Burrows and Ben Arthurs while Matthew Johnston saw his effort go just wide and Scott McArthurs' effort was saved. 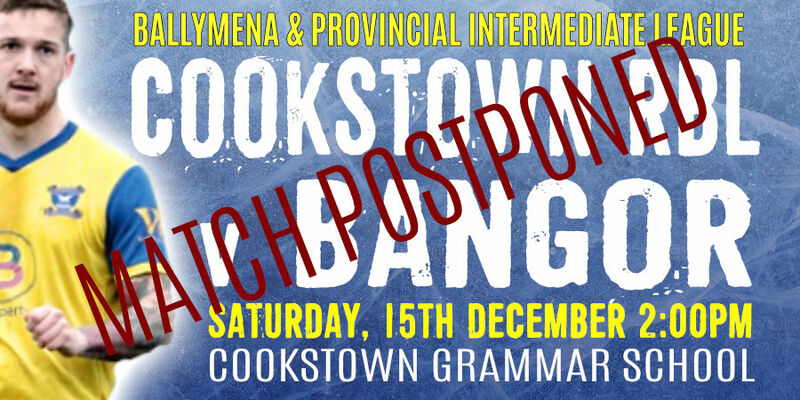 Saturday's match against Newtowne at Scroggy Road has been postponed. Bangor continued their excellent run of league form with a 3-0 win over Wakehurst at a blustery Bangor Fuels Arena this evening. Ben Arthurs set the Seasiders on their way when he powered home a near post header in the 4th minute. Ethan Boylan made it 2-0 after 19 minutes when he latched on to a low Scott McArthur cross and fired the ball back across the goal and into the corner of the Wakehurst net. Both sides struggled to cope with the windy conditions in a scrappy second half, but Ethan Boylan managed to score his second of the night in the 67th minute when he shot home from 12 yards out. 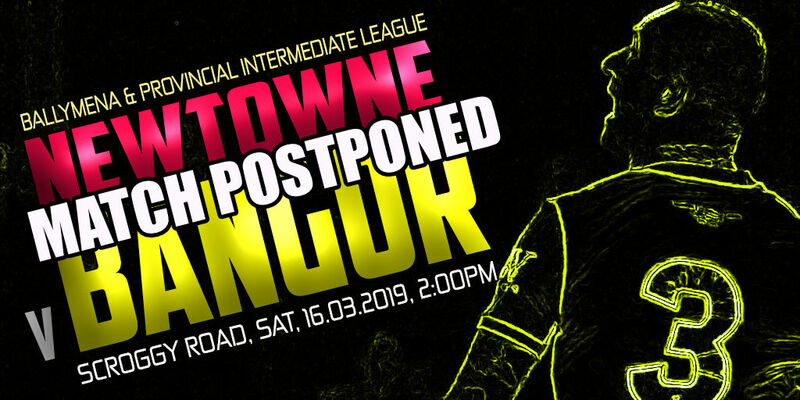 16.03.2019 - Newtowne v. Bangor, BAPL, Scroggy Road, Limavady, 2:00pm. Two first half goals against Wakehurst were enough to see Bangor through to the semi-final stage of the McReynolds Cup at the Bangor Fuels Arena this afternoon. Defender Ryan Arthur headed in a Jordan Lucas cross after seven minutes and Zach Fletcher notched up his first goal for the Seasiders just before half-time following good work from Gerard McMullan on the left. Bangor closed the gap on league leaders Glebe Rangers to six points with a remarkable 4-0 win at a wet and windy Riada Stadium this evening. Both sides struggled with the conditions in the first half and chances were very much at a premium. The deadlock was broken in the 43rd minute when Tommy Wray glanced a header against the upright and Ben Arthurs tapped in the rebound from close range. The Seasiders turned on the style in the second half despite playing against the wind. Ben Roy slammed in Bangor's second goal of the night in the 72nd minute and six minutes later, Ben Arthurs raced through to place the ball in the bottom corner of the net. The goal of the night came in the 80th minute when Matthew Johnston drove in a 30 yard strike that went in off the crossbar. D.Gibbons, T.Wray, G.Beattie, P.Dickson, M.Johnston, J.Wasson (S.Hislop), M.Cooling, B.Roy (J.Lucas), S.McArthur, E.Boylan (M.Halliday), B.Arthurs. 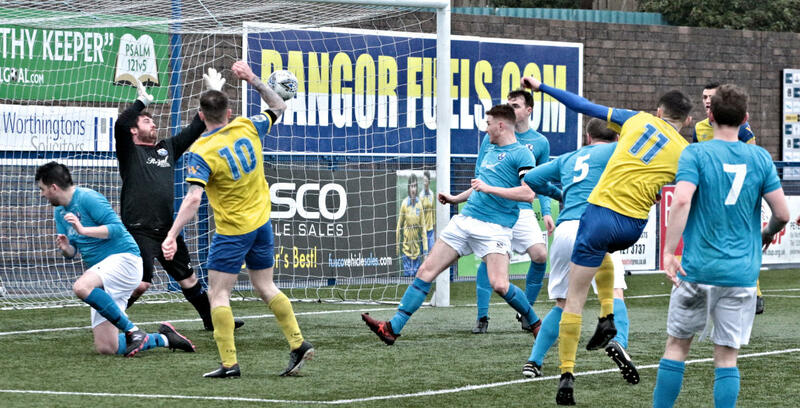 Hugh Sinclair made eleven changes to the starting line-up as Bangor progressed into the quarter-final stage of the Crawford Cup with a 3-1 win over Killymoon Rangers at the Bangor Fuels Arena this afternoon. Michael Halliday headed home a Jordan Lucas cross from the right after 12 minutes and Matty Burrows raced through two minutes later to score a debut goal. The Bangor defence appeared to be briefly unsettled when Darren Gibbons replaced the injured Paul Cairnduff on the half hour. Killymoon found a way back into the game in the 32nd minute when a corner kick was poorly cleared and Richard Donaghy headed in from 10 yards. 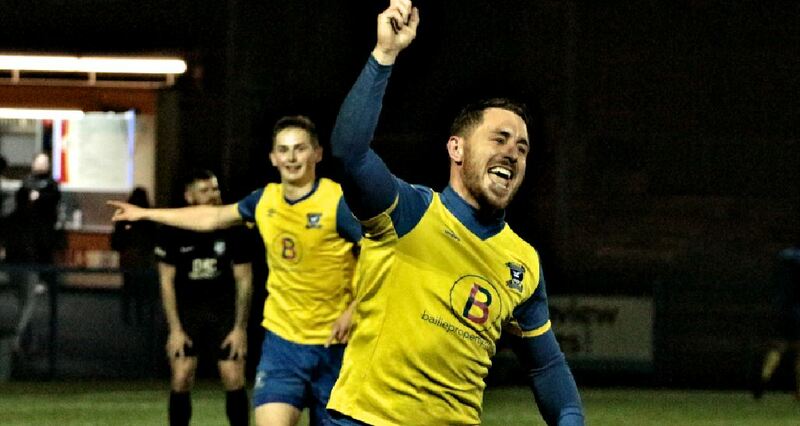 Gerard McMullan smashed home a rebound off the 'keeper in the 62nd minute to secure the victory for Bangor in a largely uneventful second half. 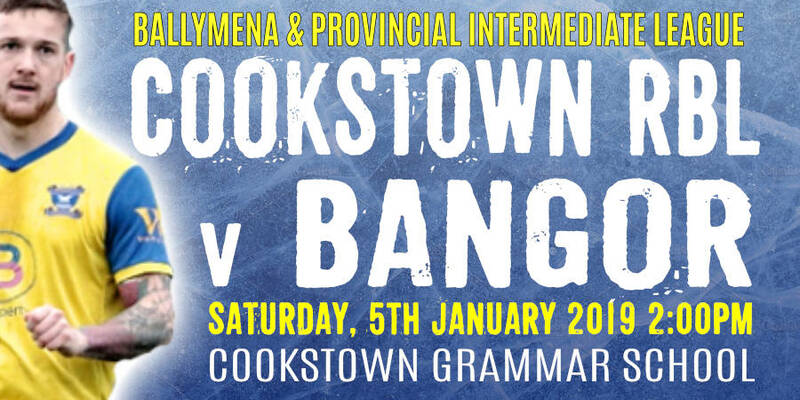 Bangor will face Cookstown Youth at the Bangor Fuels Arena in the quarter-final stage of the Crawford Cup. (Date to be confirmed). BANGOR TEAM: P.Cairnduff (D.Gibbons), B.Widdowson, C.White, R.Arthur, M.Edgar, Z.Fletcher, J.Mallin, G.McMullan, J.Lucas (R.Williams), M.Halliday, M.Burrows. Bangor closed the gap on league leaders Glebe Rangers to six points with a 3-0 win over Brantwood at Skegoneill Avenue this evening. A clinical first half double strike from Ethan Boylan gave Bangor a two goal lead at the break. The lively Scott McArthur jinked his way through the Brantwood defence in the 49th minute to provide an easy chance for Ben Arthurs who tapped in Bangor's third goal from close range. Substitute Gerard McMullan, who replaced the injured Boylan, was a constant threat on the left and was unlucky to see one chance strike the woodwork and another cleared off the line. 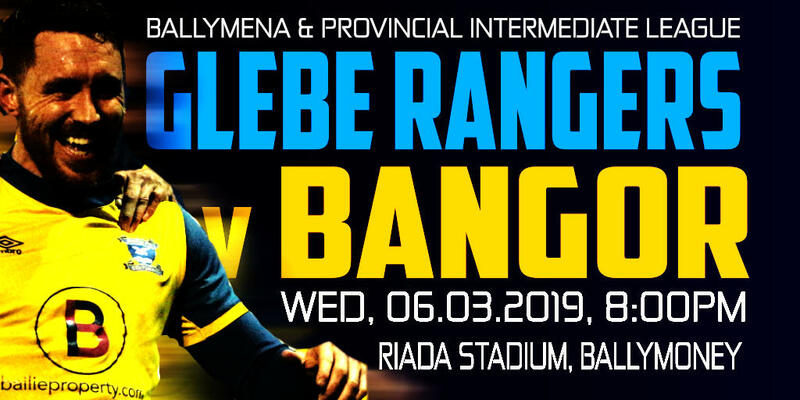 06.03.2019 - Glebe Rangers v. Bangor, BAPL, Riada Stadium,8:00pm. Bangor scored their 100th goal of the season in recording a 6-0 league win over Wakehurst at the Ballymena Showgrounds this afternoon. A perfectly weighted pass from right-back Matthew Johnston allowed Scott McArthur to pull the ball back from the byeline for Ben Arthurs to tap in Bangor's opener after 13 minutes. Bangor's second came in the 32nd minute when a Jack Wasson cross from the left was parried by the Wakehurst stand-in keeper to the feet of the lively Scott McArthur who looped the ball back in to the unguarded net. Jack Mallin put Bangor 3-0 up a few minutes later when he floated the ball from wide on the left into the top corner of the net. Bangor were 4-0 up soon after the interval. In a replica of the first goal, Scott McArthur pulled a ball back from the bye line for Ben Arthurs to tap in his 4th goal of the week. Bangor were rarely troubled at the back and the fifth goal came after a great move that was finished by the lively Scott McArthur from the edge of the penalty area. Niall Atkinson smashed in Bangor's sixth goal of the afternoon in the 71st minute when he smashed home the rebound off a saved Zach Fletcher shot. Bangor are nine points behind league leaders Glebe Rangers, but the Seasiders have four games in hand. D.Gibbons, G.Beattie, P.Dickson, T.Wray, M.Johnston, M.Cooling(N.Atkinson), J.Wasson(S.Hislop), J.Mallin, S.McArthur, B.Arthurs(Z.Fletcher), M.Halliday. Bangor had to come from behind to gain a 4-1 win over St. James Swifts in front of a bumper crowd at the Bangor Fuels Arena tonight. St James took a shock early lead in the 12th minute when an unmarked Sean Pat Donnelly headed past the stranded Paul Cairnduff. The Seasiders had to wait until the 32nd minute to find their way back into the game - Ben Arthurs caused chaos in the Swifts defence and the ball somehow ended up in the back of the net. Bangor went ahead two minutes later when Ben Arthurs looped a 12 yard header into the corner of the net. Ethan Boylan then scrambled in a rebound to make it 3-1 just before the interval. Bangor withstood some early second half pressure from the Swifts and extended their lead to 4-1 in the 62nd minute when Ben Arthurs crossed for Ethan Boylan to slot in his second of the night. A superb all round team performance from Bangor who now travel to play Wakehurst in the league on Saturday. P.Cairnduff, G.Beattie, T.Wray, P.Dickson(Z.Fletcher), M.Johnston, M.Cooling, J.Wasson, B.Roy(S.McArthur), G.McMullan(S.Hislop), B.Arthurs, E.Boylan. 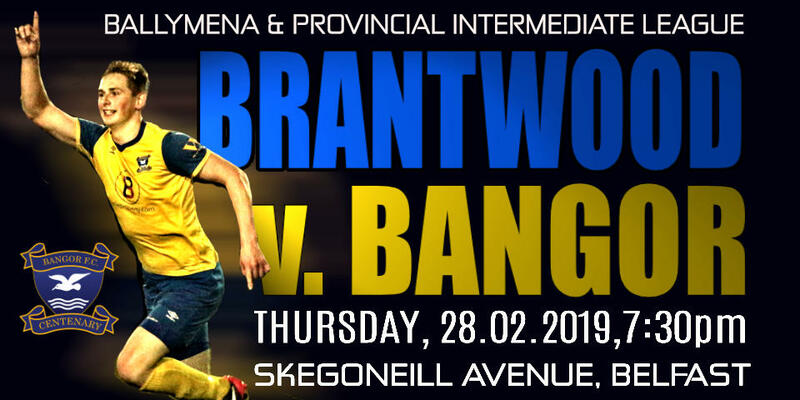 Sat, 23.02.2019 - Wakehurst v. Bangor, Warden Street, Ballymena, BAPL, 2:00 p.m.
Thu, 28.02.2019 - Brantwood v. Bangor, Skegoneill Avenue, Belfast, BAPL, 7:30p.m. 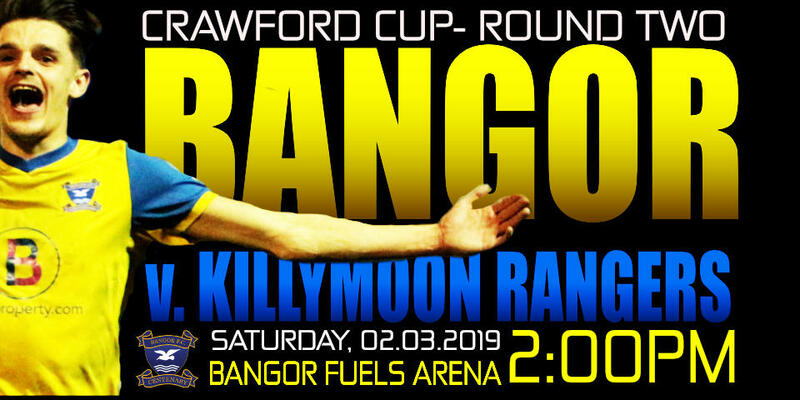 Sat, 02.03.2019 - Bangor v. Killymoon Rangers, BFA, Crawford Cup (R2), 2:00 p.m.
A much changed Bangor side made it through to the second round of the Crawford Cup at McCamphill Park, Dunloy this afternoon. Niall Atkinson fired Bangor into a sixth minute lead with a well placed 20 yard free kick that crashed in off the Dunloy crossbar. The homesters fought back and a double strike from Karl Fitzpatrick gave Dunloy a 2-1 lead at the interval. The game burst in to life minutes in to the second half when Dunloy were reduced to ten men - a goalbound Michael Halliday header was handled on the line. Halliday made no mistake from the resultant penalty. Bangor's winner came in the 68th minute when Scott McArthur drilled home a low 25 yard shot. Bangor's Gareth Beattie ballooned a penalty kick over the crossbar in the dying minutes while Dunloy squandered a great chance to level matters with virtually the last kick of the game. 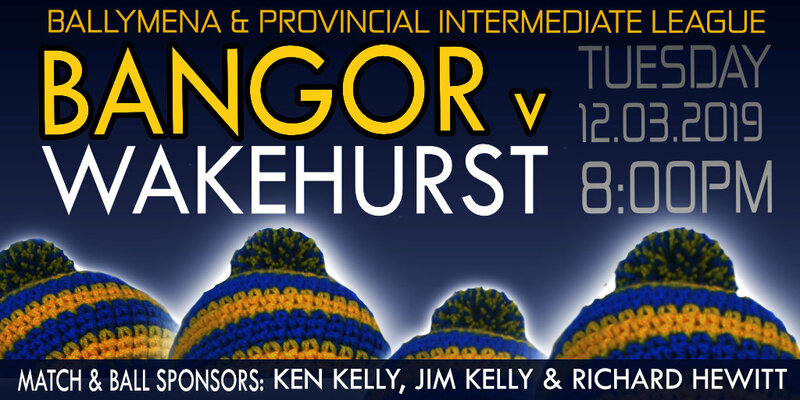 Bangor will face Killymoon Rangers in the second round of the Crawford Cup. (Date to be confirmed). P.Cairnduff, G.Beattie, C.White, R.Arthur, Z.Fletcher, S.Hislop, N.Atkinson, J.Mallin, E.Boylan (M.Halliday), B.Arthurs (P.Dickson), S.McArthur. 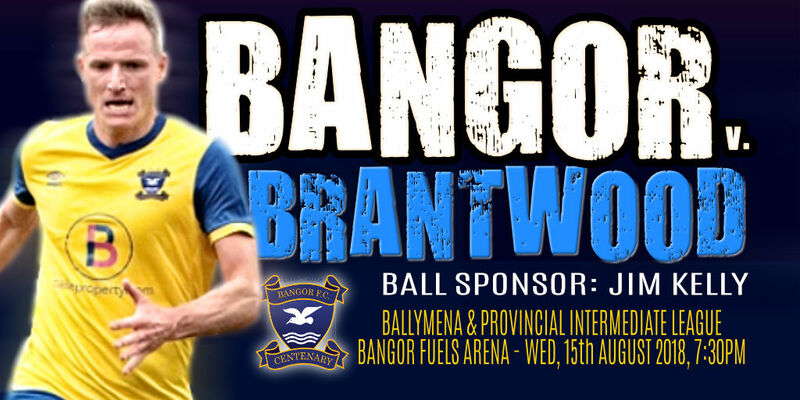 Bangor will play St. James Swifts at the Bangor Fuels Arena on Wednesday, 20th February in a League fixture. Match Kick-Off: 8:00pm. Bangor were left to rue a number of missed second half chances as they failed to make it through to the next round of the Intermediate Cup at the Bangor Fuels Arena this afternoon. In a tight first half, Matthew Johnston was unfortunate to see his 35 yard strike come back of the Crumlin crossbar. Even though the Seasiders had the Crumlin Star goalmouth under seige for much of the second half, they could not find a way through and the game remained goalless after 90 minutes. Mark Cooling finally broke the deadlock early in the first period of extra time when he slotted the ball low into the corner of the net from the edge of the area. The Seasiders looked to be heading for victory until Crumlin Star substitute Miguel Chines scrambled home an equaliser with only a few minutes remaining. Chines broke through the Bangor defence once again to slide the ball low into the corner of the net in the final minute to give Crumlin a surprise lead. However Bangor fought back and Ethan Boylan made it 2-2 with the final kick of the game. Crumlin got the better of the penalty shootout as they scored with all their spot kicks while Bangor's Matthew Johnston and Gerard McMullan saw their penalties saved. D.Gibbons, G.Beattie, T.Wray, P.Dickson, S.Hislop(E.Boylan), J.Wasson, M.Cooling, G.McMullan, M.Johnston, M.Halliday(B.Arthurs), B.Roy (J.Mallin). 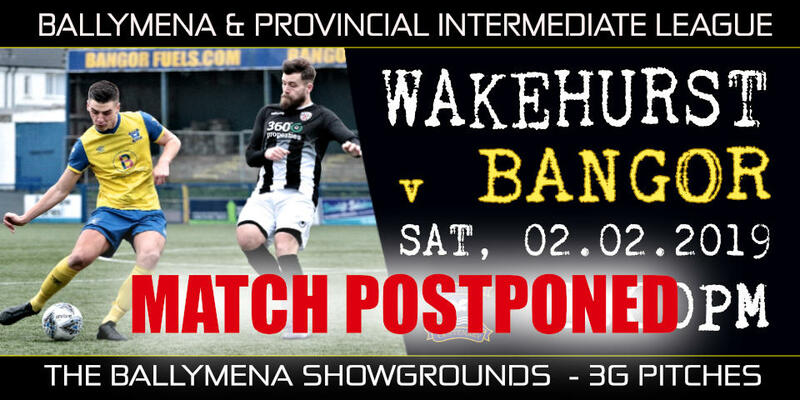 Bangor's match against Wakehurst at the Ballymena Showgrounds this afternoon has been postponed due to a frozen pitch. 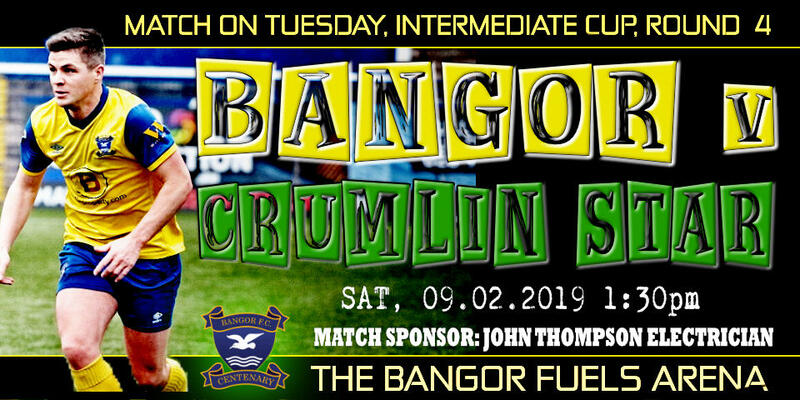 Sat, 09.02.2019 - Bangor v. Crumlin Star, Match on Tuesday Intermediate Cup (R4), Bangor Fuels Arena, 1:30pm. Bolstering Bangor's attacking options for the second half of the season is Matty Burrows. The 33 year old former Glentoran and Dundela striker has tonight joined the Seasiders from 1st Bangor. We are delighted to welcome Matty to the club and look forward to seeing him in yellow and blue. Second half goals from Michael Halliday and Ben Roy gave Bangor a deserved 2-0 win over Dunloy in the first round of the McReynolds Cup at the Bangor Fuels Arena this afternoon. After a goalless first half, Bangor took the lead in the 49th minute when a floated cross from the lively Scott McArthur on the right drifted over the Dunloy keeper's head and gave the onrushing Michael Halliday an easy opportunity to prod the ball over the line. Ben Roy latched on to a Michael Halliday pass on the edge of the area to drill home Bangor's second goal of the afternoon in the 67th minute. Dunloy were reduced to 10 men in the closing stages on a afternoon where Darren Gibbons was rarely troubled. Leaving Bangor this week to return to his former club Ballyclare Comrades is Andy Long. Andy first joined the Seasiders at the start of the 2010/11 season and went on to make over 250 appearances for the club. During that time he was part of Bangor's Intermediate Cup(2014) and O'Gorman Cup (2018) winning sides. The club would like to thank Andy for his commitment, determination and service to the club and we wish him well on his move. We are please to announce the signing of Scott McArthur on loan from Ards until the end of the season. The pacey forward featured for the Seasiders in the 2017/18 pre-season and was cup-tied for today's Intermediate Cup game. Departing Bangor for Sirocco Works earlier this week was midfielder Sammy Devine. Sammy joined the Seasiders in August 2017 and made 25 appearances last season. Sammy was also part of the O'Gorman Cup winning team. We wish him well with his new club. Bangor had to come from 2-0 down to turn around this afternoon's Intermediate Cup tie against Saintfield United at the Bangor Fuels Arena. Slack defending allowed Saintfield to race into a two goal lead after 14 minutes, but Bangor rallied and Jack Mallin found the net from outside the box for the Seasiders in the 16th minute. The sides were level at 2-2 when Jack Wasson chested in a Ben Roy cross from the left in the 36th minute. 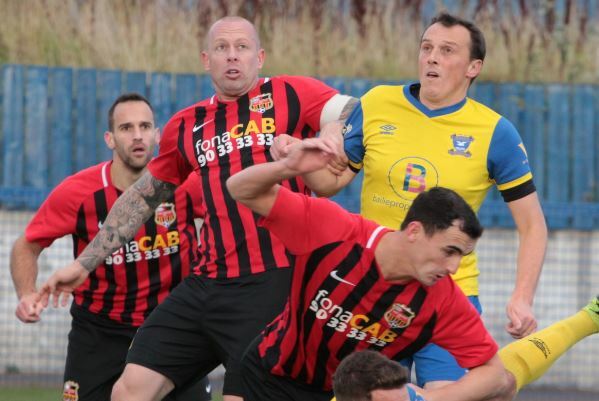 Bangor pushed themselves in front four minutes into the second half when Ben Arthurs rifled the ball into the roof of the net from three yards out. The Seasiders extended their lead further when Gerard McMullan smashed one on in from 25 yards after 55 minutes. Ben Roy drilled in Bangor's fifth from distance before Childs pulled one back for Saintfield in the 83rd minute. Jack Mallin crossed from the right in the 85th minute to set up substitute Michael Halliday for Bangor's sixth goal. P.Cairnduff, P.Dicksn, T.Wray, R.Arthurs, M.Cooling(N.Atkinson), J.Wasson, B.Roy, J.Mallin, G.McMullan(M.Johnston), B.Arthurs(M.Halliday), E.Boylan. 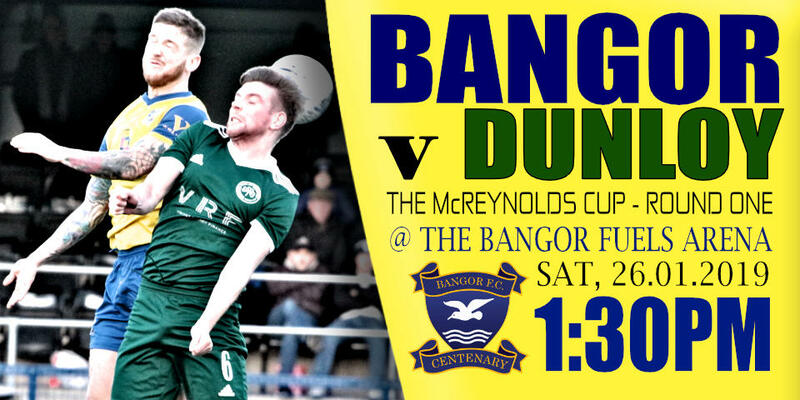 BANGOR v. DUNLOY, McReynolds Cup(R1), Sat, 26th January 2019, 1:30pm. Bangor eased their way into the semi-final stage of the O'Gorman Cup this afternoon with a 5-1 home win over Dunloy. Michael Halliday fired the Seasiders in front with a spot kick awarded for hand ball after 23 minutes and Ben Roy smashed home the second a few minutes later following great work from Gerard McMullan on the left. Striker Ben Arthurs nodding a third for the Seasiders ten minutes into the second half and the returning Niall Atkinson produced a moment of magic from the edge of the area to make it 4-0. A moment of madness in the Bangor defence allowed Declan McGarry to pull one back for Dunloy in the 78th minute before Ben Arthurs curled in number five for Bangor off the upright in the 88th minute to complete the scoring. D.Gibbons, G.Beattie, T.Wray, B.Widdowson (R.Arthur), N.Atkinson, S.Hislop, M.Johnston, G.McMullan(Z.Fletcher), B.Roy (S.Devine), B.Arthurs, M.Halliday. Making his debut for the Seasiders today off the bench was Zach Fletcher. The 25 year old defender has just completed a scholarship in the USA and has previously had spells with QUB and Lisburn Distillery. Welcome to Bangor Zach! Cookstown RBL 0-1 Coagh United; Wakehurst 1-1 Cookstown Youth. Bangor kicked off the new year with an emphatic 6-0 away league victory over Cookstown RBL this afternoon. Mark Cooling curled in a trademark 25 yard free-kick after 13 minutes to open the scoring. A fantastic bit of skill from Gerard McMullan after 31 minutes saw him ease past the Cookstown keeper and then loft the ball into an unguarded net. New signing Matthew Johnston marked his Bangor debut in explosive fashion. With an hour on the clock Matthew scored Bangor's third goal just seconds after coming on to the pitch. He followed that up with another close range strike seven minutes later to make it 4-0. A spectacular 40 yard strike from Mark Cooling gave Bangor their fifth goal in the 78th minute. Gerard McMullan hit Bangor's sixth of the day with a low shot that turned out to be the last kick of the game. The January transfer window is now open and we have already seen a number of comings and goings at the Bangor Fuels Arena. Departing Bangor are defender Chris Getty who re-joins Ballyclare Comrades. Also leaving the club is midfielder Brandon Nelson who returns to H&W Welders. We wish both players every success for the future. Returning to Bangor is midfield maestro Niall Atkinson. 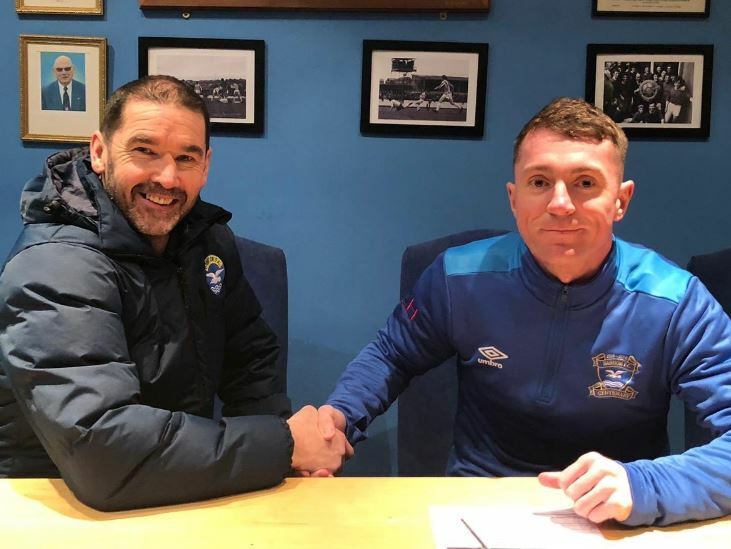 Niall returns to the Seasiders having spent 2018 with Knockbreda. Two new faces have also been added to Hugh Sinclair's squad. 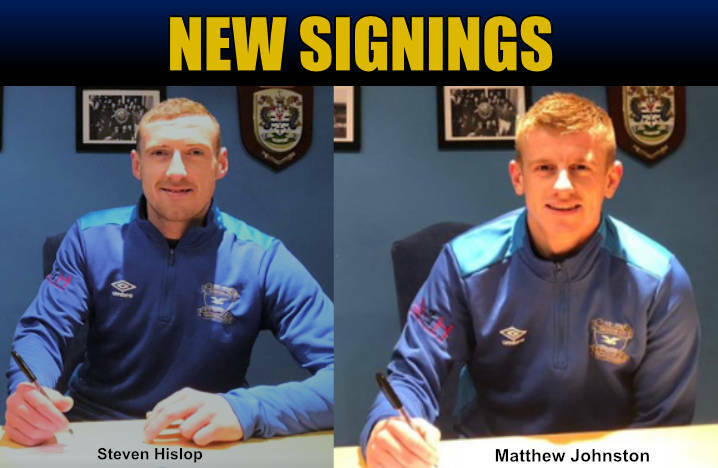 Matthew Johnston, a 26 year old right-sided player and Steven Hislop (arriving from Lisburn Distillery) have both played under Hugh Sinclair at Knockbreda. The Seasiders rounded off their fixtures for 2018 on Saturday afternoon with a hard fought 1-0 victory over Dunloy at the Bangor Fuels Arena. The result ensures that Bangor will remain undefeated in the league as we head in to 2019. Bangor currently sit in second place in the league table, 15 points behind leaders Glebe Rangers, but with six games in hand. St. James Swifts are still very much in the hunt in third place. Bangor dominated much of the first half play, but faced stubborn resistance in a well organized Dunloy back line. Gerard McMullan and Mark Cooling were both denied by the woodwork while the Dunloy keeper McGilligan did well to deny several first half efforts from the home side. A trademark 20 yard Mark Cooling free-kick early in the second half finally broke the deadlock and put the Seasiders ahead. Chris Getty headed against the crossbar and substitute Ethan Boylan could only blast straight at McGilligan from close range as the Seasiders struggled to put the game to bed. Dunloy pressed for an equalizer late in the game, and the Seasiders were only too glad to hear the final whistle. 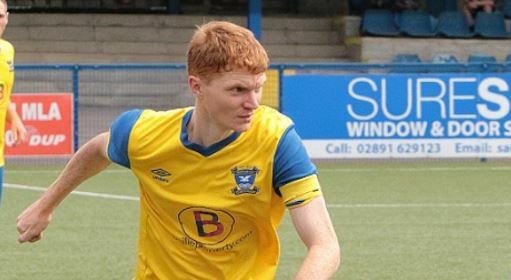 Jack Wasson and Michael Halliday both hit hat-tricks as Bangor ran out comfortable 10-1 winners over Donegal Celtic at the Bangor Fuels Arena on Saturday afternoon. Jack Wasson finished with a deft chip over the 'keeper to open the scoring after 12 minutes and he doubled his tally 9 minutes later with a neat finish from the edge of the area. Mark Cooling rifled in a 25 yard free kick after 24 minutes, and Michael Halliday headed in number four just on the half hour mark. Ben Arthurs bustled his way through the DC defence to slide in the fifth just before half-time. Jack Wasson completed his hat-trick nine minutes into the second half and Michael Halliday followed suit with a quickfire double strike to take the Seasiders tally to eight after 58 minutes. Ben Roy made it 9-0 from close range on the hour mark, before Donegal Celtic were gifted a consolation with eleven minutes remaining. Substitute Ethan Boylan completed the scoring by flicking in a Mark Cooling corner kick with eight minutes remaining. Bangor's match against Chimney Corner was postponed on Saturday morning due to a waterlogged Allen Park pitch. 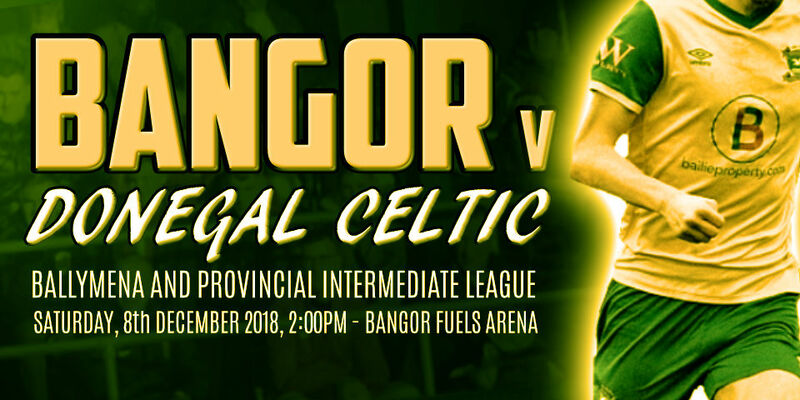 The Seasiders will be back in action next Saturday afternoon when Donegal Celtic visit the Bangor Fuels Arena for a League fixture. Ballymoney United 0-3 Glebe Rangers, Ballynure OB 5-2 Cookstown RBL, Coagh United 3-2 Newtowne, Cookstown Youth 3-2 Wakehurst, Donegal Celtic 2-2 Brantwood. The Seasiders are in 4th place in the League, 15 points behind leaders Glebe Rangers but with six games in hand. Bangor began their defence of the O'Gorman Cup on Saturday afternoon with a nervous 4-3 win over Wakehurst at the Bangor Fuels Arena. The Seasiders got off to a blistering start and had sqaundered numerous chances before Ben Arthurs finally bundled the ball over the line for the first goal after 35 minutes. Five minutes into the second half, a mix up in the Bangor defence between Darren Gibbons and Chris Getty gifted Jason Paul with an equalizer for Wakehurst. Bangor went back in front just before the hour mark when Michael Halliday nodded in a Ryan Arthur cross. Halliday repeated that feat five minutes later to extend Bangor's lead to 3-1. Michael Halliday bagged his hat-trick in the 80th minute when he fired home a Jack Mallin cross on the half volley. At 4-1, the tie appeared to be over as a contest, but when Ryan Arthur was shown a straight red card, the Bangor defence suddenly began to look vulnerable. Wakehurst replied with two quickfire goals and Bangor were left clinging on at 4-3 in the final five minutes. Thank you to our Ball Sponsors: Ken Kelly and Jim Kelly. Sat, 1st December 2018, (BAPIL) Chimney Corner v Bangor, 2:00pm. Bangor were made to work hard for their 5-3 Intermediate Cup victory over 18th Newtownabbey OB in Monkstown this afternoon. Ben Arthurs returned to scoring form with a low drive across the keeper after 17 minutes. Bangor's lead lasted until the 25th minute when the homesters drew level from the penalty spot. Mark Cooling then fired home a Bangor penalty on the half hour to given Bangor a 2-1 lead at the interval. Gerard McMullan extended Bangor's lead to 3-1, ten minutes in to the second half, but two quickfire goals (one a penalty) saw the 18th draw level at 3-3 just after the hour mark. Minutes later, a Ben Roy shot rebounded off the post and ended up in the net via a Newtownabbey defender. Ben Arthurs extended Bangor's lead with a tap in after 65 minutes to make it 5-3. Bangor had to endure several late scares, with Chris Getty and Gareth Beattie both having to make goal-line clearances. D.Gibbons, D.Beattie, T.Wray, C.Getty, P.Dickson, J.Wasson, M.Cooling, G.McMullan, B.Roy(A.Long), M.Halliday, B.Arthurs (J.Lucas) Subs: R.Arthur, J.Mallin, A.Calvert. Bangor have been drawn at home as we begin our defence of the O'Gorman Cup. 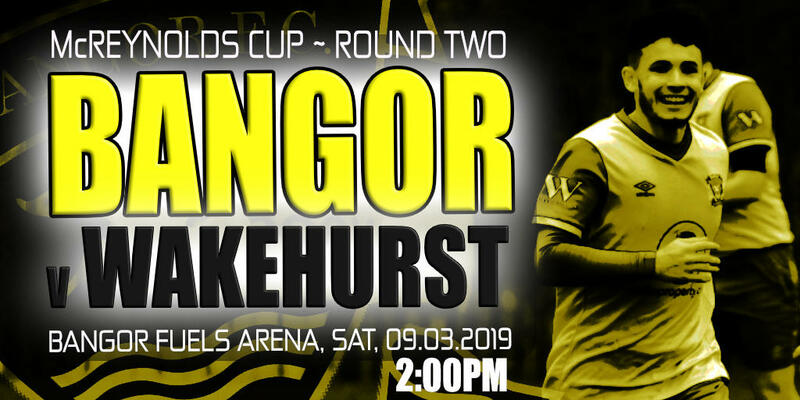 Wakehurst will be the visitors to the Bangor Fuels Arena for a first round tie next Saturday (24th). Match kick off: 1:30pm. 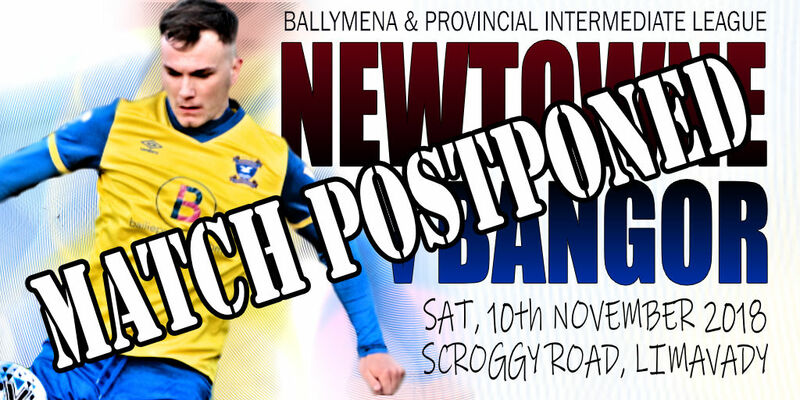 Bangor's match against Newtowne on Saturday has been postponed due to a waterlogged Scroggy Road pitch. 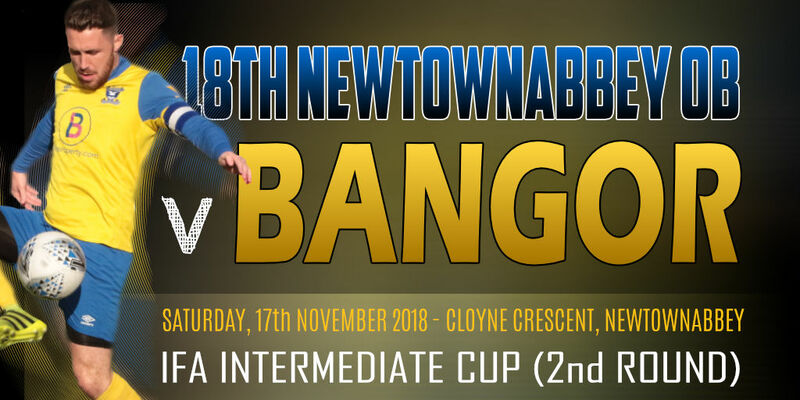 The Seasiders will be in action again on Saturday 17th November when we travel to Cloyne Crescent, Newtownabbey to play 18th Newtownabbey in the second round of the Intermediate Cup. Bangor crashed out of the Tennent's Irish Cup this afternoon with a 5-3 defeat to Crumlin Star at The Cliff. The Seasiders got off to a poor start, conceding two very early goals. Michael Halliday gave Bangor some hope when he found the net after 15 minutes and Ryan Arthur drew the sides level after 36 minutes when he headed in a Mark Cooling free-kick. Parity was short-lived and Crumlin Star were ahead again within minutes - Miguel Chines headed the ball past Gibbons to make it 3-2. Bangor fought back well in the second half and Ben Arthurs headed in a long throw from Ryan Arthur after 56 minutes to make it 3-3. Crumlin Star regained their lead with a magnificent goal in the 79th minute and McKervey slotted home a penalty a few minutes later to give Crumlin Star the victory. Bangor's undefeated start to the season came to an abrupt end this afternoon with a 2-0 defeat to East Belfast at the Bangor Fuels Arena. 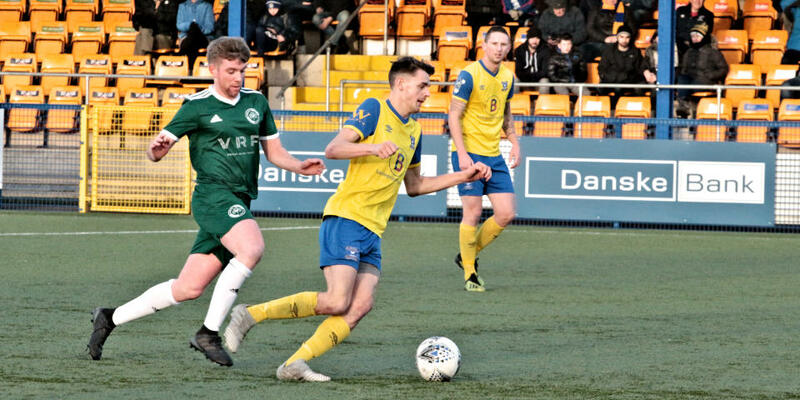 The East Belfast side outperformed the lacklustre Seasiders team throughout and they fully deserved to progress into the semi-final stage of the competition. Stephen Cockcroft fired the visitors ahead in the 30th minute with a 25 yard strike and former Seasider Karl Rossborough headed in their second goal seven minutes later. Bangor did rally in the second half, but rarely troubled the East Belfast goalkeeper. 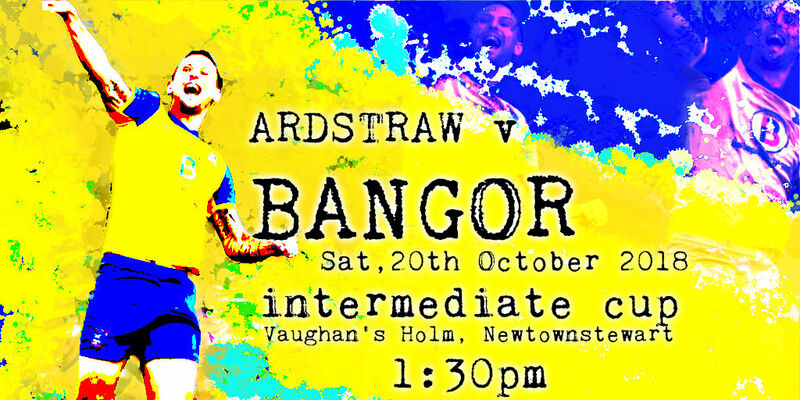 Bangor ran out comfortable 4-0 winners over Ardstraw in this afternoon's Intermediate Cup first round tie in Newtownstewart. Mark Cooling produced a neat finish from the edge of the area to put the Seasiders in front after 6 minutes. Brandon Nelson found the bottom corner just before half-time to double Bangor's lead. Substitute Gareth Beattie thumped in the third in the 70th minute and Ben Arthurs rolled the ball past Galley to round off the scoring with six minutes remaining. 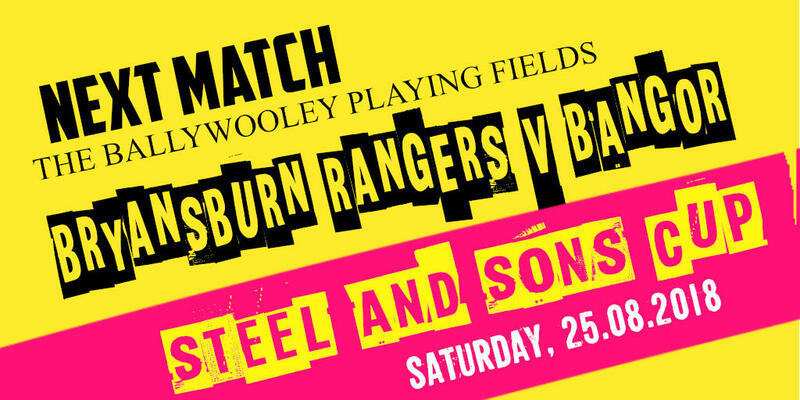 NEXT MATCH: Bangor v. East Belfast, Steel & Sons Cup Q-Final, Sat, 27.10.18, Bangor Fuels Arena. 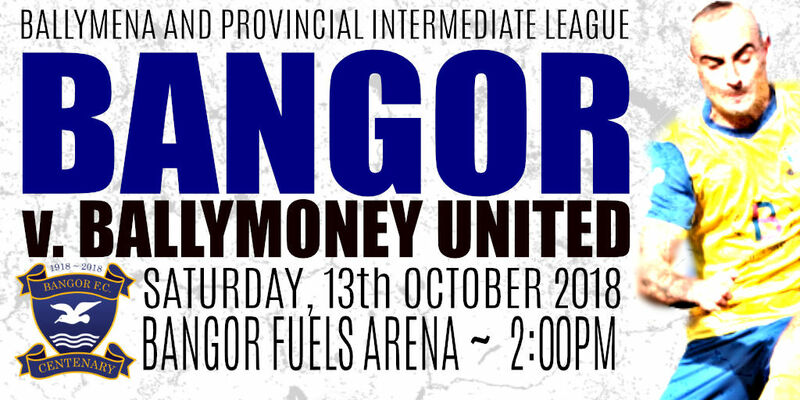 It was a case of stalemate this afternoon as Bangor and Ballymoney United played out a goalless draw at the Bangor Fuels Arena. Both sides squandered good chances as the teams struggled in the wet conditions. Cookstown Youth 2-5 St. James Swifts, Coagh United 4-0 Ballynure OB, Donegal Celtic ?-? Brantwood, Dunloy 3-1 Cookstown RBL, Newtowne 3-0 Desertmartin, Wakehurst 2-0 Chimney Corner. Bangor made it safely through to the Quarter Final stage of the Steel & Sons Cup with a comfortable 7-1 victory over Shorts FC at the Bangor Fuels Arena this afternoon. Both Andy Long and Brandon Nelson had hit the Shorts woodwork before Mark Cooling fired Bangor into a 9th minute lead with a well placed 20 yard free-kick. Bangor had to wait until the hour mark to get their second, Michael Halliday heading in from 6 yards out. Mark Cooling eluded the Shorts defence to place the ball past Thompson in the 64th minute to make it 3-0 and an unfortunate own goal from McCormick four minutes later extended the Seasiders' lead even further. A well placed Ethan Boylan shot from the edge of the area made it 5-0 to Bangor in the 71st minute and substitute Adam Calvert was on hand to knock in the sixth from close range in the 78th minute. Mark Cooling grabbed his hat-trick with a beautiful strike that went in off the crossbar to make it 7-0 in the 80th minute. Shorts bagged a consolation goal in the 87th minute when Dummigan shrugged off two defenders to slot the ball past Cairnduff. Bangor made it through to the next round of the Tennent's Irish Cup this afternoon with a narrow 2-0 home win over a very spirited Banbridge Rangers side. A super strike from Mark Cooling after 31 minutes gave Bangor the lead. However, Bangor had to wait until the 97th minute to clinch their second - Jack Mallin found himself with enough time and space in the penalty area to smash the ball past Chambers to secure the win. 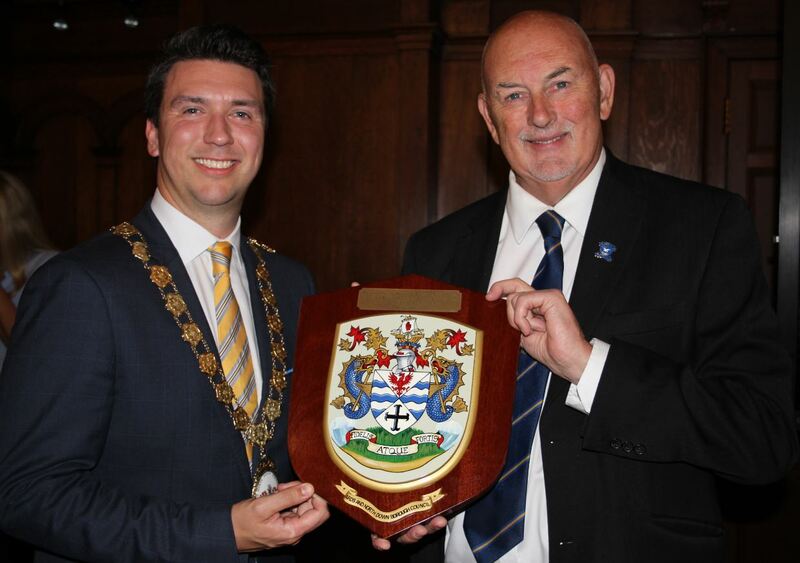 Ards and North Down Borough Council hosted a civic reception at Bangor Castle Town Hall on Thursday evening to celebrate Bangor Football Club's centenary season. The Mayor of Ards and North Down Borough Council Richard Smart is pictured left presenting a commemorative plaque to Bangor FC Chairman Nicky Davidson. Bangor continued their winning start to the 2018/19 BAPIL season this afternoon with a 4-2 win over a much rejuvenated Chimney Corner side. The Bangor line-up was: P.Cairnduff, G.Beattie, C.Getty, R.Arthur, J.Mallin, M.Cooling, S.Devine, C.Curtis, B.Arthurs, M.Halliday, B.Nelson. Subs: A.Long, E.Boylan, G.McMullan, A.Calvert, B.Widdowson. 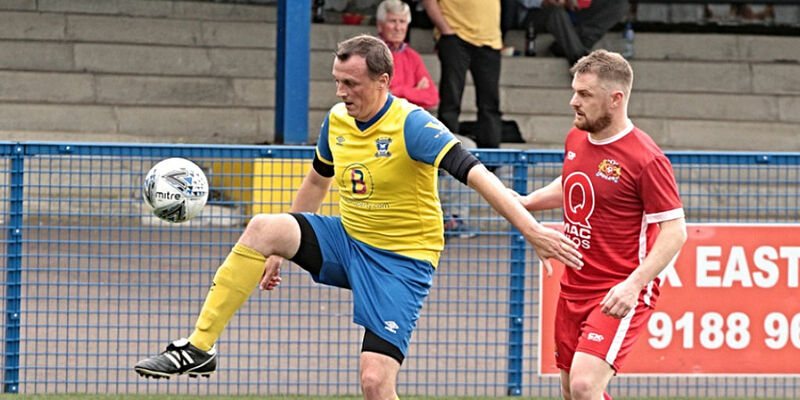 With Darren Gibbons nursing an injury, Paul Cairnduff returned to the Bangor line-up for his first competitive fixture in three and a half years. Corner dominated the early stages and the Bangor defence struggled to cope with their fast breakaways and dynamic movement on set pieces. It was no surprise when Haskins fired past Cairnduff to give Corner a 13th minute lead. A stunned Bangor side burst into life and Jack Mallin fired past McGrath in the 18th minute to level matters. Mark Cooling drilled home a penalty after Mallin had been tripped to give Bangor a 26th minute lead. Corner fought back and another quick breakaway caught out the Bangor defence in the 30th minute and Robinson made it 2-2. Ben Arthurs restored Bangor's lead in the 34th minute, nodding in a Mark Cooling corner kick from close range. Arthurs was on target five minutes later when he found time and space in the area to blast the ball past McGrath from 15 yards out. The second half never really sparked into life, although Corner's manager was given his marching orders for an abusive outburst on the touchline. 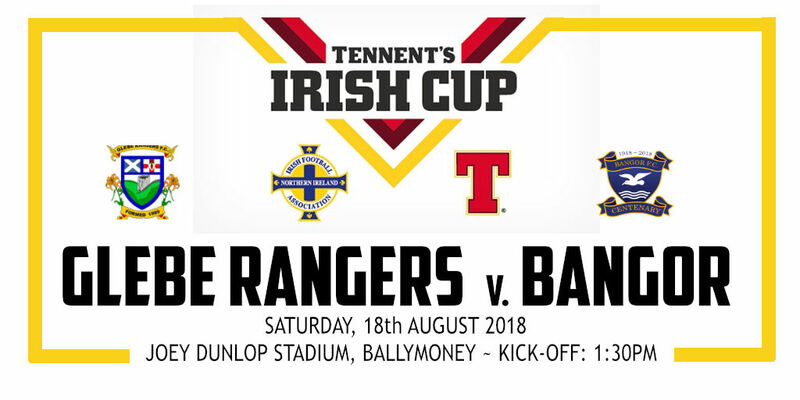 Sat, 29.09.2018 - Tennent's Irish Cup - BANGOR v. BANBRIDGE RANGERS, 1:30pm. Bangor made it through to the last 16 of the Steel and Sons Cup this afternoon with a 2-1 win over Glebe Rangers at the Riada Stadium. Bangor fell behind to an Ian Christie header after 8 minutes, but hit back in the 24th minute when Mark Cooling drilled home a penalty following a clear trip on Michael Halliday. Substitute Ethan Boylan scored with his first touch of the season to give Bangor the lead in the 74th minute, glancing in a Mark Cooling free kick. Bangor were reduced to 9 men following a melee which saw Bangor's Jack Wasson and Ben Roy dismissed, along with Glebe's David Brown. The nine men of Bangor defended their lead resolutely and in the closing stages Ben Arthurs came close to extending the Seasiders lead. The Seasiders have been drawn at home to Billy Youle & Mark Magennis' Shorts F.C. in the next round on Saturday, 6th October. 1918 NEWS - BANGOR PLAYED WITH GREAT DASH! 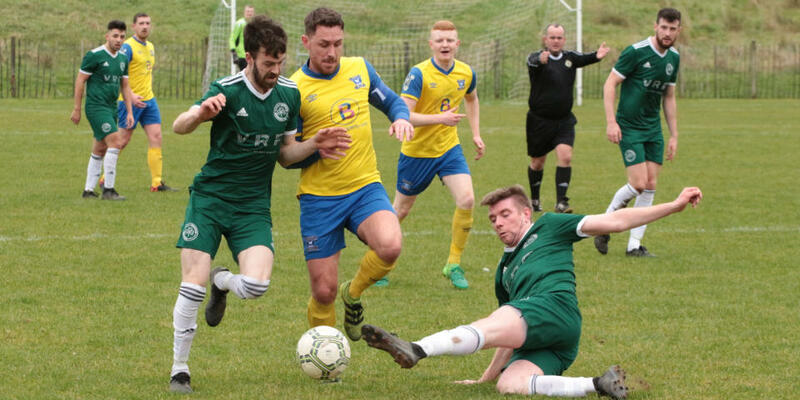 The newly formed Bangor team played their first ever game and met with Irish Football Alliance champions Crusaders at the Shore Road enclosure. Bangor won the toss and decided to defend the railway end. Bangor repelled some Crusaders attacks, and from a kick out, Bangor raced their way down to the other end of the field and after a well sustained attack, Dorrian from the outside right position put across a glorious centre for Billy Bowman (pictured left) to net beautifully. On the restart, Bangor continued to play with great dash and tested the abilities of the home defence to the utmost. The game continued to be played very fast up and down the field. Before the interval, Crusaders drew level despite being repulsed on several occasions by the tip-top Douglas. In the second half, both teams made great efforts to score, some of the movements were worthy of going a long way to see, and only the excellent defence on both sides prevented a score. Eventually, a melee around the goal gave Crusaders the lead. The efforts of neither side subsided, and when the long whistle went, Crusaders won by two goals to one. It being admitted on all sides to have been the best game played against the champions of the Alliance this long time. A much changed Bangor side went down 2-0 at home to Lisburn Distillery in a friendly this evening.Michael O'Hanlon gave the Whites a 14th minute lead. Nick Beta made it 2-0 just after the break. Brandon Nelson went close to scoring on two occasions in the second half. Jack Mallin rattled the Distillery crossbar near the end. Sat, 15th September, GLEBE RANGERS v BANGOR, Steel & Sons Cup, Riada Stadium. We are pleased to announce that the signing of Luke Fisher was completed before the transfer deadline. The left sided 19 year old joins the Seasiders from Dundela, having previously had spells with Warrenpoint Town, Glenavon and Fleetwood Town. Bangor had to come from behind in their game against Coagh United this afternoon to maintain their 100% start to the season. A quickly taken free-kick after 25 minutes caught the Bangor defence napping and James Ferguson slotted home from 10 yards. The Seasiders hit back three minutes later when Ben Arthurs was on hand to prod the ball over the line from Michael Halliday knock down. Michael Halliday put Bangor into a 34th minute lead when he headed in a pinpoint Ben Roy cross from the left. The Seasiders had to wait until the 83rd minute to extend their lead. Defender Tommy Wray rose highest to head in a Mark Cooling corner-kick. A goal from Batista a few minutes from full-time set up a nervous finish for the Seasiders, but a neat passing move on the right in the 90 minute gifted substitute Brandon Nelson with an easy tap in from a couple of yards out. Bangor have no match scheduled for next weekend but we are back in action this Wednesday evening when we take on Lisburn Distillery in a friendly match at home. Match kick off 7:45pm. On Saturday, 15th September we return to the Riada Stadium to take on Glebe Rangers in the Steel & Sons Cup Third Round. 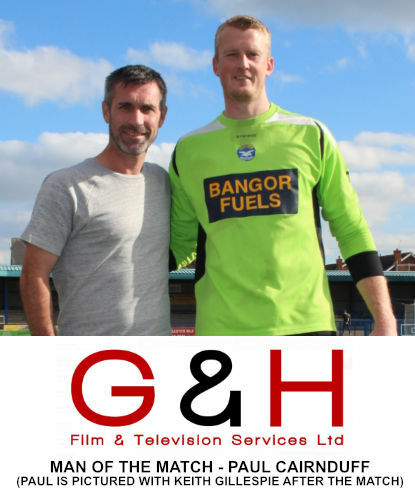 This week, we welcomed back goalkeeper Paul Cairnduff to the Bangor squad. Paul, who suffered a serious leg injury a few seasons ago while playing for Bangor at Solitude re-joins us from 1st Bangor. He will act as a backup 'keeper for Darren Gibbons. Bangor were made to work hard for their second round victory at Ballywooley in the Steel and Sons Cup this afternoon. Mark Cooling scored the only goal of the first half, drilling a low ball in from the edge of the area. Bangor increased their lead in the 65th minute when a whipped cross from Mark Cooling on the right was headed home by Ryan Arthur from a few yards out. Mark Cooling netted his second of the game from an inswinging corner kick in the 85th minute - Ryan Arthur helped the ball on its way as it crossed the line. Both Jack Mallin and Ben Roy took advantage of a tiring Rangers defence in the closing minutes to take Bangor's tally to five for the afternoon. Bangor have been rewarded with a third round tie away to Glebe Rangers at the Riada Stadium on Saturday, 15th September. 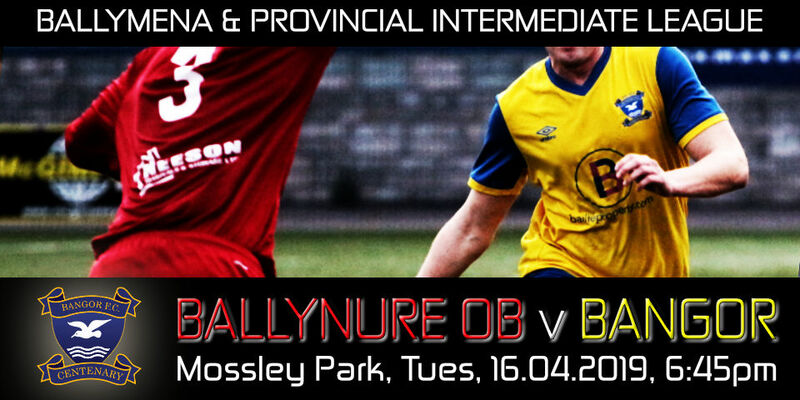 Bangor ran out 5-0 winners over Ballynure Old Boys at Clandeboye Park this evening. A low strike by Jack Wasson from the edge of the box deceived McIlwaine midway through the first half to give Bangor the lead. Bangor then hit two quick goal just after the break. Mark Cooling drilled a low free-kick through a crowd on 49' and minutes later substitute Michael Halliday opened his account for Bangor by heading in a Cooling corner-kick. Michael Halliday rolled back the years on 62 minutes when he turned on the edge of the box to rifle in Bangor's fourth goal of the night. Right on full-time, defender Ryan Arthur rose highest to head in Bangor's fifth goal from close range. Bangor have been drawn at home to Banbridge Rangers in the 2nd Round of the Tennents Irish Cup. The tie will be played on Saturday, 29th September. Bangor made it through to the second round of the Tennents Irish Cup this afternoon with a 2-1 win over Glebe Rangers at the Riada Stadium. Michael Hunter put the Seasiders ahead with a long range effort after 31 minutes. Glebe were reduced to ten men when Adam Calvert was floored by a wild lunge from Jake Francis. Ben Arthurs continued his fine scoring run when he prodded in a Jack Mallin cross to make it 2-0 in the 90th minute. Glebe grabbed a late consolation goal when Reid headed past Gibbons deep into injury time. Hugh Sinclair has today bolstered his squad by signing three new players. Joining the Seasiders after a spell coaching in China is 28 year old attacking midfielder Colum Curtis. Colum played under Hugh Sinclair at Knockbreda and also had spells with Loughgall and Ards in 2015. 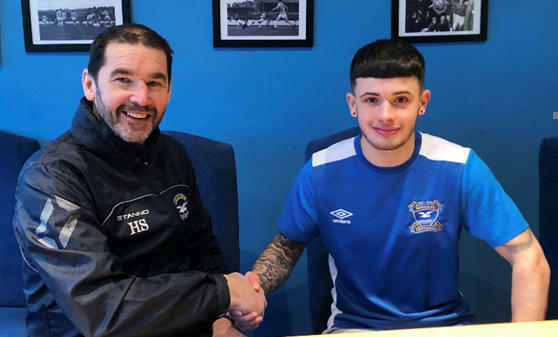 Midfielder Brandon Nelson also joins the Seasiders from H&W Welders where he was part of the U-20 squad that lifted the George Wilson Cup last season. Finally, veteran striker Michael Halliday has joined the Seasiders from Knockbreda. Michael, who has won every major honour in the local game with Glentoran and Crusaders brings a wealth of experience to the club. After a frustrating and scoreless first half, The Seasiders finally broke the deadlock in the 63rd minute when Ben Arthurs headed in a deep Ben Roy cross from a yard out. Substitute Gerard McMullan, who dislocated a finger minutes after coming onto the pitch, returned to the field to win a foot race to the ball and scored into an empty net in the 72nd minute.Ben Arthurs wrapped up the scoring when he tapped in from close range with virtually the last kick of the game. Bangor travel to the Ballymoney to face Glebe Rangers on Saturday in the Irish Cup. Match kick off is 1:30pm. Bangor produced a very solid performance at the Mid-Ulster Sports Arena this afternoon in a 3-0 league win over Cookstown Youth. Darren Gibbons was rarely troubled as the Seasiders dominated the game throughout. A no-nonsense header from Ryan Arthur after 37 minutes gave Bangor a deserved lead, and two minutes later, it looked like Ben Arthurs got the final touch on a Mark Cooling inswinging corner for the second. Substitute Gerard McMullan secured the victory in the 78th minute when he slid the ball under the advancing Cookstown 'keeper. Dunloy 0-6 Brantwood; St. James Swifts 4-1 Newtowne; Wakehurst 2-1 Donegal Celtic; Coagh United 1-2 Sofia Farmer; Ballynure OB P-P Cookstown RBL. Bangor kicked of the new season with an entertaining 4-2 league win over Desertmartin at Clandeboye Park this afternoon. Recent signing Jack Mallin gave Bangor a 17th minute lead with a bullet header from an Adam Calvert cross. The lead lasted until the 48th minute when a Shields shot from the edge of the box found the bottom corner of the Bangor net. Bangor were quick to fight back and were ahead again within a minute - Ben Arthurs headed home a Ben Roy cross. Mark Cooling made it 3-1 from the penalty spot on the hour mark before Adam Calvert headed in Bangor's fourth goal in the 80th minute. There was a late consolation for Desertmartin when Murray found the bottom corner of Gibbons' net.